Businesses are always on the lookout for ways to improve their marketing efforts and sales numbers. As an inbound marketing agency, we’re always excited when we meet these businesses as we can show them how inbound marketing can help them hit their goals. But, some businesses aren’t quite ready to take the plunge into Inbound. Other businesses just want to help train their internal team on how to employ modern marketing methods to improve their online activities. So, we put together a great online marketing training webinar designed to educate businesses on the massive potential of inbound marketing and deliver expert, digital face-to-face training to small groups on exactly how to harness inbound marketing for their business. Why should you choose a marketing webinar? You can find heaps of information on the Internet around inbound marketing (HubSpot are a global leading authority and our inbound marketing blog is pretty helpful too), what it is and how you can use it. You can also download our handy introduction to inbound marketing guide for free. However, there’s no substitute for hands-on training where you can ask questions and get answers tailored to you and your business needs. With our online marketing webinars, you’ll get dedicated time with one of our inbound sales and marketing experts to ask questions, get feedback and explore ideas and recommendations specific to you. 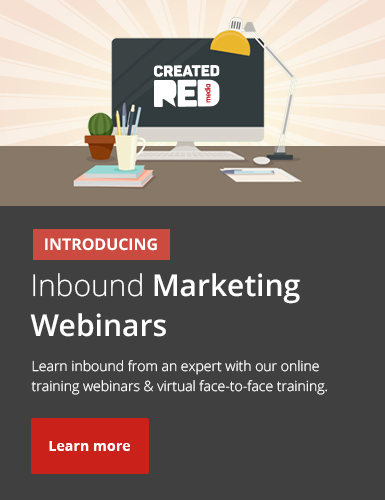 Our inbound marketing webinars are effectively online versions of our inbound marketing workshops. We work with small groups of up to 15 people to deliver a complete intro to inbound marketing and how you can apply the methods to your very own business. What does a marketing webinar cover? Each attendee on our digital marketing webinars simply joins the session which one of our inbound experts will lead. Questions are very much encouraged and specific help and advice will be provided in spades during each course. The aim of each webinar is to impart a detailed understanding of inbound marketing, help identify areas in your business that could be improved, and ultimately deliver a set of manageable marketing improvements start using today. Website and marketing recommendations – lots of real-world examples here!